(1) Make The Dough: In a small saucepan, warm the milk over low heat until lukewarm (110-115°F). Pour the warm milk into the bowl of a stand electric mixer fitted with the dough hook attachment. With a spoon, manually stir in the sugar and yeast. Cover with a towel and let sit until the yeast is foamy, about 5-10 minutes. On low speed, beat in the softened butter until it is slightly broken up. Next add the eggs, one at a time, and then the salt. The butter won't really be mixing into the mixture, so don't be alarmed if it stays in pieces. On low speed, gradually add the flour. Once it is all added,beat on medium speed until a soft dough forms. Increase speed to medium-high and beat until the dough is soft and supple, about 6 minutes longer. *If you do not have a stand-mixer with a hook attachment, knead the dough by hand in this step. (2) Transfer the dough to a lightly floured surface and knead it with your hands for 1 minute. Form the dough into a ball and transfer it to a lightly greased bowl. Cover the dough loosely with plastic wrap or a damp towel, and let sit in a warm place until doubled in size, about 1 to 2 hours. (3) Butter/grease/spray with nonstick spray the bottom of a 9x13-inch baking dish, then line with parchment paper. Turn the dough out onto a lightly floured work surface and, using a rolling pin, roll into a 13x18-inch rectangle. You can use a ruler for accuracy. Make sure the dough is smooth and evenly thick, even at the corners. (4) For The Filling: Spread the softened butter all over the dough. Don't skimp-- you want it all on there. In a small bowl, toss the cinnamon and sugar together until combined and then sprinkle evenly over the dough. Tightly roll up the dough to form an 18-inch-long log. If some filling spills out, that's ok just sprinkle it on top of the rolls. Cut into 12 even rolls (about 1½-inches in width each). Arrange them in the prepared baking pan, cut sides up. Cover the rolls very tightly with aluminum foil (no rolls exposed, please-- this dries out your dough) and stick in the refrigerator for 8-12 hours*. (5) Remove rolls from the refrigerator and let rise in a warm place just as you did in step 2 until they are puffy, about 1-2 hours. (6) After the rolls have risen, preheat the oven to 375°F. Bake for about 25 minutes, until they are golden brown. About halfway through the bake time, cover the rolls loosely with aluminum foil so the tops don't brown too much. Remove pan from the oven and allow to cool on a wire rack for about 10 minutes as you make the icing. (7) Make The Icing: In a medium bowl using a handheld or stand mixer fitted with a paddle attachment, beat the cream cheese on medium speed until smooth and creamy. Add the confectioners' sugar, milk, and vanilla. Beat on low speed for 30 seconds, then switch to high speed and beat for 2 minutes. 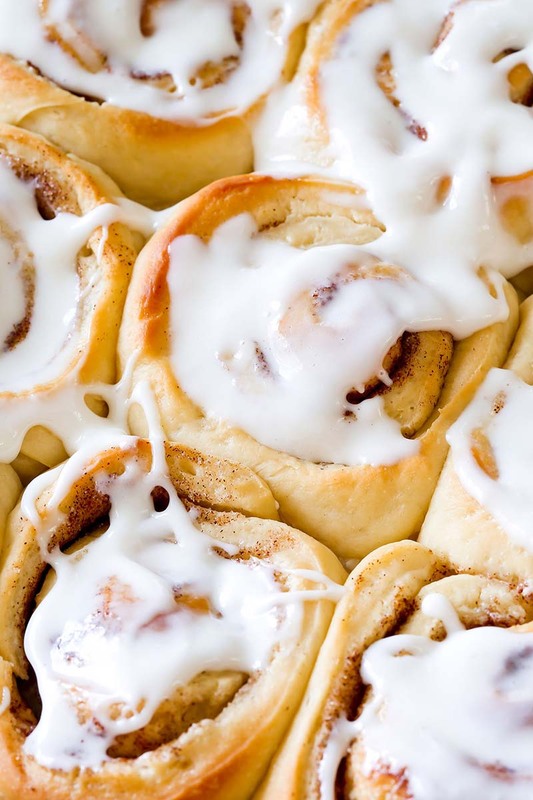 Using a knife, spread the icing over the warm rolls and serve immediately. (8) Cover leftover frosted or unfrosted rolls tightly and store at room temperature for up to 3 days. You can choose to store in the refrigerator, but this can dry them out. Baked rolls can be frozen up to 2 months. Thaw overnight in the refrigerator and warm up before enjoying. *No time for overnight? If planning to bake the rolls right away, in step 4-- instead of sticking the rolls in the refrigerator, loosely cover them and let rise in a warm place just as you did in step 2 until they are puffy, about 2 hours. Then continue with step 6. I made these and my family thought they were great. I’ve also made them with strawberry jam in the middle for one son who loves strawberries.